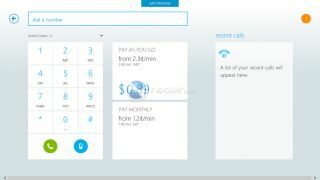 We've had our first unofficial glimpse of Skype for Windows 8 and, you won't be shocked to learn, it looks very metro. That's metro with a lower-case 'm', of course, given that Microsoft is currently in the process of renaming its user interface style, which originated on Windows Phone (it might end up called Modern). The unfinished preview app uses a series of panels that you can presumably swipe through on Windows 8 tablets and touchscreen PCs. Neowin, which scored a bit of hands on time with it, describes the UI as "fluid and dare we say fast too". The site put the Skype app through its paces, making calls and doing multi-person chats. Despite being unfinished the app is reported to be fairly stable. Presumably this means that an official release date can't be far off – probably around the time when Windows 8 gets its official release in September. Microsoft bought Skype in late 2011 for around $8.5 billion, and has plans to integrate the VoIP service into Office 2013.